1Marine Ecology, Iranian Fisheries Research Organization, Tehran, Iran. 2Faculty of Marine Sciences, Chabahar Maritime University, Chabahar, Iran. The larval fish assemblages in near shore coastal waters are complex both in terms of spe-cies composition and distribution patterns (Azeiteiro et al., 2006). The composition of the species assemblages, in which depending on the time of the year, it is possible to identify diverse groupings, may not necessarily represent similar-ities in adult habitat or direct phylogenetic relat-edness (Herna´ndez-Miranda, et al., 2003). Many marine fishes, including those that are not resi-dent species, spawn in or near productive coastal bays and estuaries (Azeiteiro et al., 2006). De-spite the existence of spawning seasonality, larval fish species may also show differences in their spatial patterns of abundance (e.g. with respect to bathymetry, or distance to shore and the presence of estuary mouths/river outflow) (Herna´ndez-Miranda, et al., 2003). These patterns are partic-ularly strong in areas very near to the coast and estuaries (Azeiteiro et al., 2006). Temporal varia-bility in larval fish abundance has mainly been related to the meteorological, environmental (temperature, salinity and turbidity) and oceano-graphic seasonal features (regional oceanography and upwelling events) (Hernández-Miranda et al., 2003). Examining spatial and temporal patterns in distribution and abundance of ichthyoplankton in relation to hydrological conditions may pro-vide insight into the adaptation of spawning strat-egies to the prevailing physical and biological processes (Somarakis et al., 2002). Research on the identification and abundance of fish larvae in the Persian Gulf goes back to 1973, when Nellen (1973) conducted the first study on the diversity and abundance of fish lar-vae in the Arabian Sea and Persian Gulf. He re-ported the fish larvae of the Gobiidae, Clupeidae and Pomadasyidae families as dominant from the Iranian waters of the Persian Gulf. Since then many research works have been conducted by Iranian experts who were mainly focused on the identification and abundance of fish larvae (Dehghan et al., 2000; Rabbaniha, 1998; Owfi & Bakhtiary, 1999; Jokar & Saraji, 2002). This research aims to study the fish larvae as-semblages and the effects of hydrological factors on their abundance and dispersal, as well as the changes in the temporal and spatial distribution patterns of fish larvae in the study area. This area covers the northern coastal waters of the Persian Gulf along the Bushehr province (Figure 1), which is located between the latitudes 29° 08´ 05''-29° 34´ 45''and longitudes 50° 30´ 30''- 50° 41´ 15'', with a variable depth of less than 10 me-ters along the coastal line, between Doobeh creeck to Genaveh Port. From the ten designated sampling stations, eight were located at the junc-tion of the creeks to the Persian Gulf, except sta-tion two which was at the estuary near the mouth of Helleh River and station ten which was situ-ated out in more deep marine waters. Persian Gulf is a semi-closed and continental shelf region which is connected to the Oman Sea by the Hormuz Strait. The freshwater discharge from the confluence of two large rivers (Karun from Iran and Shat-alarab from Iraq) in the north-western part of the Persian Gulf dilutes the sea-water in its vicinity, and the salinity increases gradually from north to south along with evapo-ration. Throughout the year a surface water current with a velocity of more than 10 cm/s flows from the Oman Sea into the Persian Gulf through the Hormoz Strait. This current of relatively low sa-linity, flows north-westward along the Iranian coast, and against the prevailing north (Shamal) winds, diluting the hyper-saline water of Persian Gulf (Swift and Bower, 2003). At the longitude of about 51.5°E, it changes its course back to-wards the Hormuz Strait. Through its circulation and evaporation, this current becomes denser and sinks, and finally as a high salinity undercurrent, leaves the Persian Gulf through the deeper part of the Hormuz Strait (ROPME, 2004). Monthly larval sampling was conducted in 10 sampling stations from October 2001 to Septem-ber 2002 using a 60 cm diameter and 500 μm mesh size Bongo net. Adverse weather conditions prevented sampling from six stations in May and one station in June 2002. Towing was oblique and the volume of the filtered water was calcu-lated by a calibrated flow-meter attached to the mouth of the net (Smith & Richardson, 1977). Simultaneous records of water temperature, sa-linity, depth, transparency and pH were also done at each station. To illustrate the hydrological pattern of the study area a cumulative graph were plotted based on the standardized salinity and temperature data. Monthly variation of temperature and salinity were drawn by scatter graphs as well as the graphs for the changes in depth and transparency. Fish Larvae abundance were standardized to the number of larvae per ten square meters (Smith & Richardson, 1977) and transformed by the formula, log(x+l), where x is the family abundance (number of larvae per 10 m2 surface area). A data matrix was formed by these values for conducting the statistical analysis. After nor-malizing the data ANOVA was performed in "R" for the comparison of the fish larvae abundance in all stations and sampling months. To find the indicator family in each hydro-logical condition (cold, warm), an Indicator Val-ue was (InVal) estimated. This value is obtained by multiplying the product of two independently computed values: the specificity (SPj,s) and fideli-ty (FIj,s) of a family ,s, by 100 toward a group of samples, Gj. NIj,s is the mean abundance of family s across the samples Gj,NI+j is the sum of the mean abun-dance of family s within the various groups, NSj,s, is the number of samples in Gj where family s is present, and NSj+ is the total number of samples in that group. The specificity of a family for a group is therefore greatest if this species is pre-sent only in this group, whereas the fidelity of a family to a group is greatest if this species is pre-sent in all samples of the group considered (Anneville et al., 2002). To evaluate the relationships between fish larva (Dependent continuous variables) and tem-perature, salinity, pH, depth and transparency (Independent variables); Principal Component Analysis (PCA) with supplementary variables was applied. For multivariate data analysis, we used R version 2.11.1 (2010), of the FactoMineR (Husson et al., 2008) of “R” statistical package (Adler, 2010). Hydrological conditions were mainly affected by seasonal changes in the weather temperature and rainfall. Therefore the period of this study was divided in two seasons, ie: Cold Season (No-vember 2001 till March 2002) and Warm Season (April 2002 till October 2002). The variations in temperature and salinity are shown in Figure 2. The mean temperature in cold and warm seasons was 16.3 ºC and 25.7ºC respectively. Figure 2. 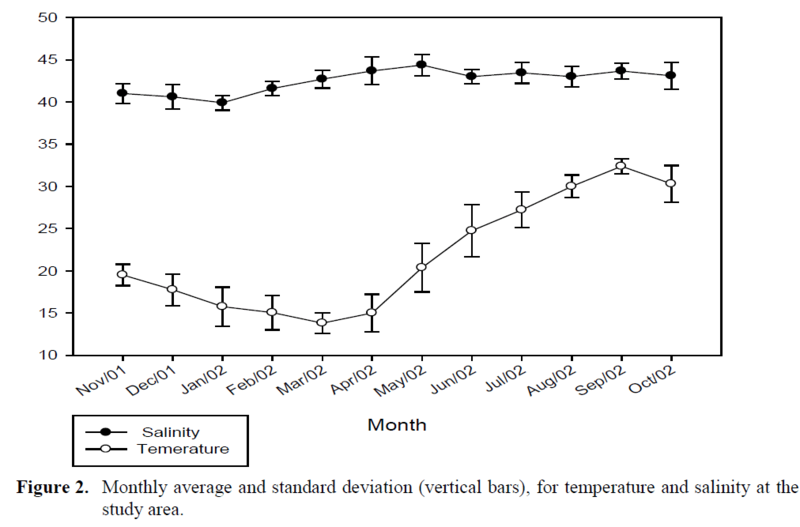 Monthly average and standard deviation (vertical bars), for temperature and salinity at the study area. Throughout the entire study a total of 3787 fish larvae belonging to 20 families were identi-fied. The mean abundance was 8.1844 per 10 m2 and Clupeidae, Gobiidae and Sillaginidae had more relative abundance respectively (Table 1). 57% of the larvae composition of the samples be-longed to the pelagic group. This ratio was lowest at station 5 (1.46%), and showed a considerable increasing trend at stations 1, 2, 3 and 10. Table 1. 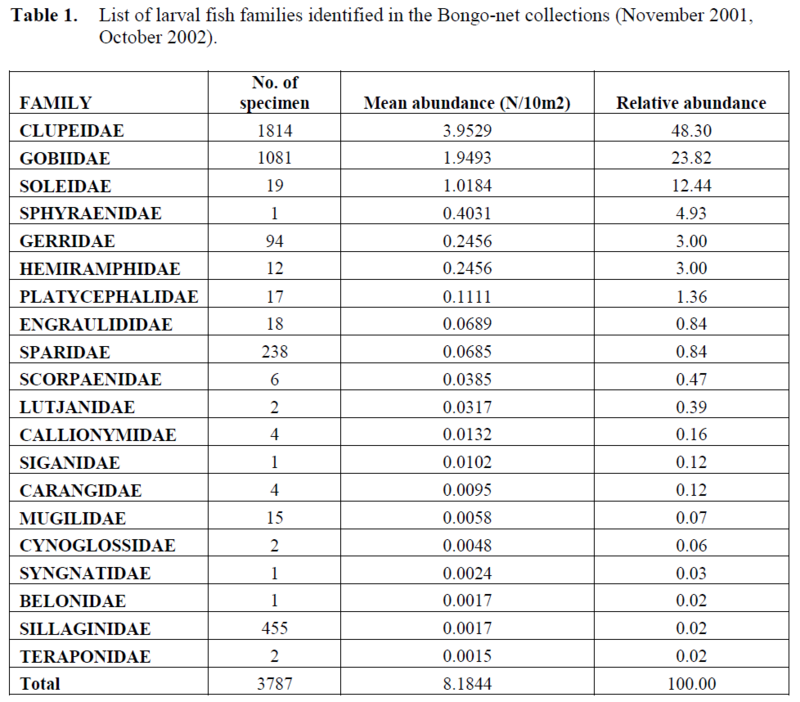 List of larval fish families identified in the Bongo-net collections (November 2001, October 2002). The variation of fish larvae abundance be-tween the stations in base of transferred data (log(x+1)) is shown in Figure 3. There were Sig-nificant differences between stations in base of ANOVA test (P<0.05) and stations 1, 2 and 10 demonstrated the highest abundance. The result of PCA with supplementary analyses showed a positive correlation between the larvae of the families Sillaginidae (0.66), Gerreidae (0.63), Clupeidae (0.52), Engrulidae (0.51), and Soleidae (0.44), Whereas the larvae of the families Mugi-lidae, Sparidae and Gobiidae revealed negative correlation with dimdesc axes 1, and two axes dimdesc1 and 2, respectively explained 20.60 and 15.97 % of the variance in the fish larvae of all families in the study area. There were a weak re-lationship between larval abundance and envi-ronmental factors; transparency (0.47), depth (0.41), Temperature (0.37) and salinity (0.22) re-spectively. The monthly changes in the fish lar-vae abundance is shown in Figure 4 in base of transferred data (log (x+1)). The significant dif-ferences were evident between months in base of ANOVA test (P<0.05), and the highest abun-dance were recorded in May and June. Signifi-cant differences were evident between months in base of ANOVA test (P<0.05), and the highest abundance were recorded in May and June. Figure 3. Abundance averages and standard deviations (SD) for fish larvae (larvae per 10 m2) in the sampling stations, abundance transformed by the formula, log(x+ l). Figure 4. PCA with supplumentary variable, correlation between fish larvae abundance and some envronmental factors at the study area (November 2001, October 2002). In cold season, 1127 larvae specimens be-longing to 10 fish families were recorded. Six of these families comprised 89% of the total abun-dance, and the families Gobiidae, Clupeidae, Sparidae, Sillaginidae, Mugilidae and Soleidae, had the highest to the lowest percentage in a de-scending order. Gobiidae was the indicator fam-ily with an indicator value of 38%. In this period two dimdesc 1 and 2 explained 23.50 and 21.41 % of the variance in the fish larva families in the study area, and Sillaginidae (0.80), Clupeidae (0.66), Soleidae (0.41) had more correlation, while Mugilidae, Gobiidae, Sparidae showed weak or negative correlation and the result of PCA showed a weak relationship between envi-ronmental factors and larval variation; Tempera-ture (0.35), depth (0.31), transparency (0.22), and salinity (0.05) respectively. In the warm season, 2660 specimens belong-ing to 20 fish families were recorded. Seven of these families comprised 89% of the total abun-dance, and the families Clupeidae, Gobiidae, Sparidae, Gerreidae, Soleidae, Sillaginidae and Engraulidae, had the highest to the lowest per-centage in a descending order. During this season Clupeidae, a pelagic and littoral family, was the indicator family with an indicator value of 38% followed by Engraulidae. In this period dimdesc 1 and 2 analysis explained 22.45 and 19.36 % of the variance in the fish larva family in the study area respectively. Engraulidae (0.64), Gerreidae (0.61), Soleidae (0.61), Sillaginidae (0.51), Clu-peidae (0.33), Sparidae (0.11) and Gobiidae (0.07) had positive correlation with dimdesc 1. Figure 7 shows a weak relationship between lar-val abundance and environmental factors. The variable factor map in Figure 7 shows a positive value of (0.48) for depth and (0.43) for transpar-ency. It also demonstrate a weak and negative correlation between salinity (-0.12), and temper-ature (0.022) with dimsec 1. Figure 5. Monthly abundance averages and standard deviations (SD) for fish larvae (larvae per 10 m2) at the study area, abundance transformed by the formula, log(x+ l). Figure 6. 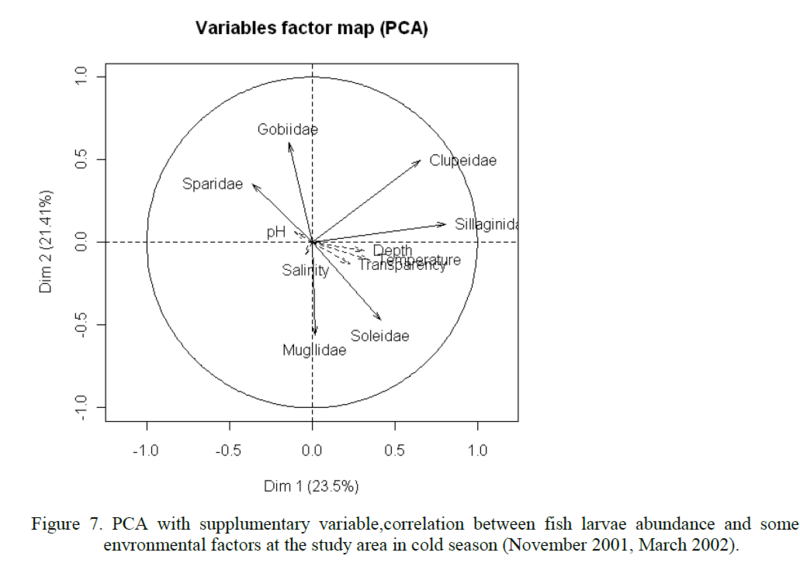 PCA with supplumentary variable,correlation between fish larvae abundance and some envronmental factors at the study area in cold season (November 2001, March 2002). Figure 7. PCA with supplumentary variable correlation between fish larvae abundance and some envronmental factor at study area in warm season (April 2002, October 2002). The fish larvae assemblages showed different distribution patterns during warm and cold sea-sons. Seasonal patterns of fish larvae abundance are linked to the reproductive strategies of adult populations and phases of their life cycles, which in turn are often associated with oceanographic and meteorological features (Hernández-Miranda et al., 2003) this study fish larvae from more fa-milies, and more abundance were recorded in warm seasons compared to the cold season. This can be attributed to the brooders which start their spawning period during spring and early summer. Two families, Clupeidae and Gobiidae were dominant in the area and represented as indica-tors of warm and cold seasons respectively. Clu-peidae is a well known pelagic group which comprised the highest percentages of our samples in Bushehr waters, and its main spawning period coincides with early spring. Pelagic fishes such as clupeids produce pelagic eggs and their larvae are carried out to the coastal food-rich areas with sea currents, and their presence in these regions is simultaneous with peak production period of phytoplankton and zooplankton (Keenleyside, 1979). A higher abundance of this family was recorded at stations 1, 2, 3 and 10 compared to others. The pelagic groups (Clupeidae and Engrauli-dae) comprised 64.72 % of relative abundance in the warm season whereas in cold season they oc-cupy only 16.38% of the relative abundance. Go-biidae was an indicator of the inshore group of stations (1-9) with muddy intertidal flat zone. They produce benthic or demersal eggs, which are probably not affected by adjective processes until they hatch, thus reducing the chances of be-ing transported offshore. Therefore, the distri-bution pattern observed might be related to both coastal spawning strategy and low dispersal due to the non-pelagic nature of their eggs. These re-sults are similar to those published by Hernán-dez-Miranda et al. (2003). Gobiid state in this re-gion was similar to previous fish larva studies in Bushehr province, with more abundance in creek or estuary stations (4, 5, 7) than other families. In general, the assemblage structure and dis-tribution patterns found in this study can be com-pared with other studies in the region and were similar to Rabbaniha (1998), Owfi & Bakhtiary (1999), Jokar & Saraji (2002). The main habitats were coastal and creek, estuary type (except Nayband Bay with rocky-coral habitat), and Go-biidae and Clupeidae were the dominant family groups. The abundance and distribution of fish larvae depends on favorable biological conditions and fish spawning in time and places that will en-sure the existence of proper and sufficient food, and minimum risk from predators and inappro-priate environmental conditions (Wootton, 1990). In case of this research, the study area was a shal-low coastal region with sandy and muddy bot-tom. In all stations except station 10 the depth was less than four meters (Figure 8), and the tur-bidity triggered by wave action, caused damage to the delicate gills of tiny larvae. Therefore among the hydrological factors, depth and low transparency (or turbidity) was two main factors affecting the presence of the fish larvae. The re-sult showed more abundance of fish larvae at sta-tion 10 with a depth more than other stations. It seems that depth was the most effective deter-minant of the abundance and the composition of fish larvae at this site. Figure 3 shows more abundance of fish larvae at stations 1, 2 and 3 which are located in the vi- cinity of Bushehr city. This can be related to the anthropogenic factor effects. The treated sewage effluents of Bushehr city are discharged to the Persian Gulf. These nutrient rich effluents cause eutrophication and plankton blooms in these ar-eas, providing favorable grazing grounds, and subsequent more survival chances for fish larvae. These results are consistent with other ichthy-oplankton studies on continental shelves around the world (Somarakis et al., 2002, Kendall & Dunn. 1985, Espinosa-Fuentes & Flores-Coto.2003, Somarakis et al., 2011). However the effect of depth was reduced in cold seasons, since other factors such as marine currents which in-tensifies due to prevailing local winds, will affect the transportation of fish larvae specially Gobiids to offshore areas, and consequently representing more abundance in this region. This study investigated the species composi-tion and dispersal patterns of larval fish assem-blages, at near shore shallow environments of northern coast of the Persian Gulf along the Bu-shehr province shoreline. The fish larvae compo-sition was dominated by inshore species; benthic in cold season, and pelagic in warm season. The results showed that temporal and spatial varia-tions in the larval fish assemblages were related to environmental conditions and biological dy-namics. Our findings also suggest that abiotic factors profoundly affect the existence and occur-rence of the biotic elements, and both abiotic and biotic parameters, regulated the abundance and distribution of larval fish in the near-shore shal-low waters. The authors would like to thank Dr Juan Car-los Molinero (IFM-GEOMAR) for his help in training the Ecological Analyses Package. We also greatly appreciate the consistent help and cooperation of our Marine Ecology colleagues at the Iranian Shrimp Research Center in Bushehr, with the field work and sampling. Adler, J., (2010). R version 2.11.1 (2010-05-31). The 'R' Foundation for Statistical Compu-ting. ISBN 3-900051-07-0. 672pp. Dehghan, M. S., A., Savari, P., Kochnin, and Maramazi, J.Gh., (2000). Abundance, diver-sity and distribution of fish larvae in the es-tuary and west coast of Khouzestan. Fishery Scientific Bulletin, Iran. pp.14 (in Persian). Husson, F., Josse J., Lê, S., Mazet, J., (2008). FactoMineR: an R package for multivariate analysis, Journal of Statistical Software, 25(1): 18. Jokar, K., Saraji, F., (2002). Hydrology and hy-drobiology creek of Laft and Khamir. Final report, Research Center of Marine Ecology of Persian Gulf. pp.90 (in Persian). Kendall A.W., Dunn, J.R., (1985). Ichthyoplank-ton of the Continental Shelf Near Kodiak Is-land, Alaska U.S. Department of Commerce, National Oceanic and Atmospheric Admin-istration, National Marine Fisheries Ser-vice.NOAA Technical Report NMFS 20. Nellen, W., (1973). Kind and abundance of fish larvae in the Arabian Sea and the PersianGulf (The biology of the Indian Ocean). Springer – Verlag, Frankfurt. pp.45. Owfi, F., Bakhtiary, M., (1999). Study on diver-sity and abundance of Ichthyoplankton in the creek-estuary Busher. Final report, Irani-an Fisheries Research Organization, Iran. pp.50 ( in Persian ). Rabbaniha, M., (1998). Study on diversity and abundance of Ichthyoplankton in the Nayband Bay (Bushehr province). Final re-port, Iranian Fisheries Research Organiza-tion, Iran. pp.101 (in Persian). Regional Organization for the Protection of the Marine Environment (ROPME), (2004) State of the Marine Environment Report (2003), Kuwait.18-27. Smith, P.E., Richardson, S.L., (1977). Standard techniques for pelagic fish eggs and larval surveys. FAO Fish. Tech. Pap., 175, 1-107. Swift S.A., Bower S., (2003). Formation and cir-culation of dense water in the Per-sian/Arabian Gulf. Woods Hole Oceano-graphic Institution, Woods Hole, MA 02543. Wootton , R.J., (1990). Ecology of Teleost fishes. Chapman & Hall New York. pp.309.